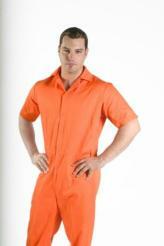 I ordered 32 jumpsuits for our departmental Halloween decorating contest. We had to order an additional jumpsuit and it arrived in time for Halloween. 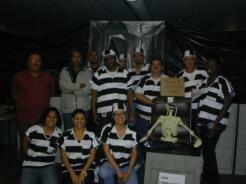 We set our department up as a state penitentiary and won the contest. I want to thank you very much for prompt service and great quality jumpsuits. I hope we will have a need to use your service again. You don't get wonderful customer service like this everyday. Thanks again. Just a bit of a note to express my opinion of your Company , I had the pleasure of speaking with Carol Johnson a couple of days ago in your Web Sales & customer service Dept. We have since exchanged a couple of emails. your camo Coveralls & even though I am only a private customer & just don't have the need to buy much she was more helpful than any other person I have dealt with in the USA. Nothing was a trouble for her , I got all my questions answered and she would have to be the most courteous person I have dealt with , Also the Lady who answers the phone was most pleasant . ( I did not get her name ) And even though the item I wanted for my wife was not in stock Carol was prepared to let me know when they would be and email a reply. Carol is a definite asset to your company and would you please mention to her that I have emailed both of you. .
By the way this is the first time in my life that I have done this. even though we live in Australia the temps at night paticularly where we live in the Southern Highlands get to well below freezing at night & we do a lot of Spotlight shooting ( Culling Kangaroo's under permit ) & if you don't mind , I could write to our national shooting magazine & recommend your company for this product, if you do not wish this thats fine. Reason for contacting National Textile was that I had a very nasty experience with a Distributor for cold weather clothing , and the bloke I was speaking to just hung up the phone whilst I was still talking & he had been very abrupt to start with. Needless to say I phoned them back & got into them , Even explained if he did that in Australia he would cop a bunch of fives , and thats not five dollar notes I'm talking about. then had to explain what that meant & I said a smack in the mouth often offends, they got it then. I also emailed their CEO expressing my thoughts , Ask Carol to show yourselves a copy of which I forwarded to her. Well thats about it for now, congratulations on having such excellent staff & caring about the little customers. I just sent an order for two comfort scrubs. I neglected to choose the color of the scrub shirt. I would like to ask for navy blue; the same as what was chosen for the scrub pants. Thank you for your service. I ordered two sets of uniforms for my husband from your company once before. He had so many complements on his top notch uniforms. Thank you for a quality product. I just wanted to thank you for all of your help. The jumpsuits came out better than I had imagined. Very good quality. Thank you again for getting these to me on time. Thank you for your help in obtaining our scrubs. 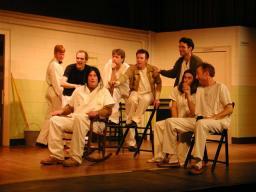 We are using them in a community theater production of One Flew Over the Cuckoo's Nest. I thought you might like to see a few pictures of them "in action". Thanks again! I logged in with a new address from Yahoo.com and got a new password that way. I need to keep a log of my passwords. Sorry for you that you had to go through all this trouble. 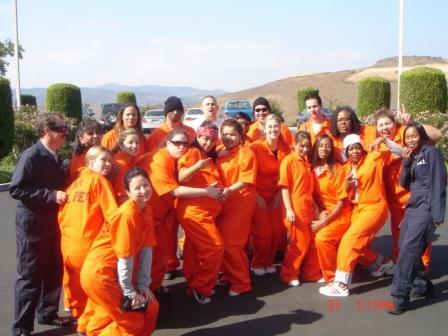 Hey, Wanted to let you know I do love the uniforms I get from National textile & apparel. They stay looking nice, because I do wash them in Woolite for dark clothes. I get allot of good comments at work for my appearance. Everyone is always asking, hey where did you get your uniforms and I tell them about your company. Thanks for being so fast for the delivery too. I had ordered from a Medical Supply Company affricated with our hospital and it took seven weeks to get two pair of pants. That's too long. Thanks again, I appreciate your attention too this. Have a good day. I purchased 5 chef coats from your company, and I like them very much. As time goes by however, buttons from those coats have started to come off. Is there any way you could send me about 12 buttons? The coats are the white ones with the full sleeve. I think your products are vastly superior to the other manufactures products I have purchased in my 10 years of being a professional chef, and will be purchasing from your company in the future. The scrub tops just arrived - They look fantastic!! You all did such a great job with the printing. experience and judgement to design the finished product. according to their preferred size. You (and your company) are just fabulous! We won the group costume contest at work. Thank you Jennifer, that will be fine. It is rare to see great customer service these days but this is one. I will make sure I tell my friends and coworkers about your company. 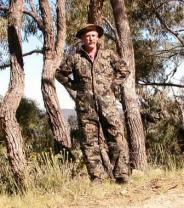 I am wearing my coveralls today and it is very comfortable. I just hope they don't shrink too much as they fit just right at the moment.